The historical landmarks of Piraeus give the city much character, and whilst they don't quite rival the Acropolis, Temple of Olympian Zeus and Parliament Building within Athens, they are still quite impressive. 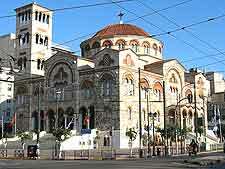 Adding much character to Piraeus are the city's medieval 'Long Walls', and the hard-to-miss Cathedral of Agia Triada. 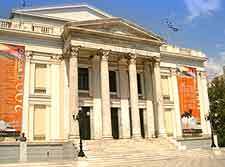 The Neo-classical style Municipal Theatre is amongst the most famous of all the historical landmarks in Piraeus and resides within the centrally located Korai Square, close to a large selection of shops and cafes. Boasting classical Greek architecture, with stone columns and a symmetrical palatial-style entrance, the Municipal Theatre first opened its doors to audiences in 1895 and has been restored relatively recently, in the early part of the eighties. Inside, the hall of the Municipal Theatre is shaped rather like a horseshoe and features galleries and balconies spanning four different levels. Capable of accommodation seated audiences of around 1,300 people, the Municipal Theatre regularly stages various performances and concerts, and is also home to the History Archives of the City and the Aravantinos Museum of Stage Designing. Check the local newspapers for the latest information about what's on here. 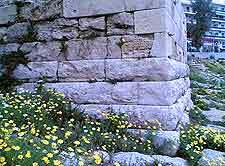 The ancient city walls remain is surprisingly good condition and were originally constructed to connect the city of Athens with the three natural harbours of Piraeus. Built as far back as the 5th century BC, the long walls were rebuilt several times, after being destroyed by the Spartans in the 4th century BC, and again by the Romans in the 1st century BC. The walls were once 6,000 metres / 19,685 feet in length and up to 20 metres / 66 feet in height, and successfully defended the cities from many sieges and attacks. Today, you can also check out the remains of the main gateway, which was one part of the Long Walls and suggests its former grandeur. The Cathedral of Agia Triada is an important landmark in the city for a number of different reasons, and stands close to the harbour, dominating the area. Not only is the church and very history and impressive 18th-century building, featuring a highly decorated exterior and central domed roof, but the Cathedral of Agia Triada is actually home to the remains of the ancient city, which are housed within the basement area. 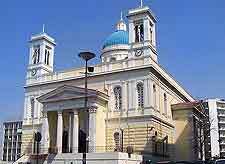 The cathedral is easy to find, enjoying a central situation in Piraeus, near to both the port and the metro station. 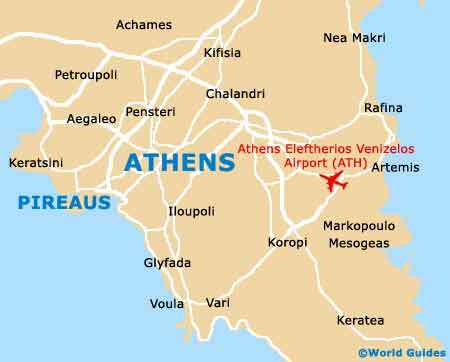 More information about Athens Landmarks and Monuments.